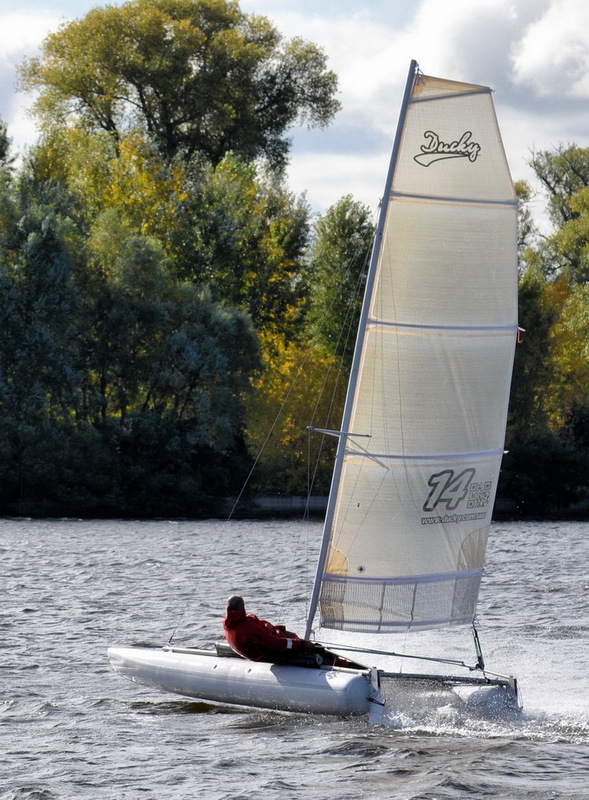 Ducky14s is an uncompromising racing catamaran. The prefix “s” is an abbreviation for sport, which testifies to the sporting character of this model. As a result of experiments and searching, it was possible to create a unique design that combines the best qualities of inflatable and solid-body catamarans. Sensations from the control of this catamaran are similar to those from the control of a solid-body catamaran. At the same time, due to the small weight of the catamaran itself, even better dynamics are provided, and the low keel shape of the floats in combination with the two rudders provides excellent controllability and control in all driving modes. Having such a simple design, the catamaran is assembled without the use of any tools within 30 minutes! Additionally, it is possible to install an outboard engine with the power of 2.2-3 hp on the catamaran. For this purpose, a special transom board fastening to the stern beam is provided. In the production of our catamarans, we use only high-quality materials and components from the world’s leading manufacturers. The frame, mast and connectors are made of aluminum alloy, which has high strength and lightness, and also has high corrosion resistance in sea water. For additional protection against corrosion, all parts are anodized. Сenterboard and rudder of fiberglass reinforced plastic. Sail made of Dimension-Polyant dacron (170 g/m2) or mylar. All fastening elements are made of stainless steel. Hulls of two sections made out of Valmex, special PVC boat fabric (1000 g/sq.m).